You can learn a lot about computer history, or any history now that I think about it, just by looking through eBay. 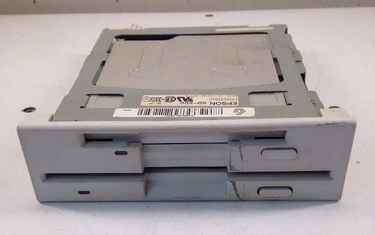 Case in point, 5.25 inch floppy drives. Nobody in the right mind would be looking at or purchasing these clunky, loud boxes now unless they were interested in building vintage computers, or replacing parts in one. Or in my case, seeing how much extra gear I can cram into either my sleeper NAS or vintage DOS tower, like a gentleman. I love how they matched the cutouts like that. And also note the eject button on the lower 5.25 inch unit to match the 3.5 inch drive; other 5.25 inch drives at the time had levers which either rotated or lowered down to clamp disks into place. But hold on, what if you like the idea of a more modern drive interface, but you didn’t need one of those newfangled 3.5 inch drives with their rigid cases and extra capacity. Maybe your machine already had a 3.5 inch drive occupying your twisted ribbon cable, or you were trying to cut costs. Maybe you wanted your machine to look more impressive with two physically-separated drives. It definitely shows an evolution in hardware design and miniaturisation. The Panasonic I scavenged from the family 486 for my Pentium 1 box needs the full volume for all its mechanical and electronic parts!